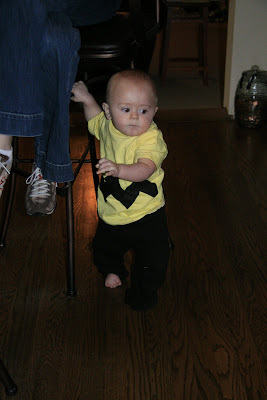 Charlie Brown (aka Aidyn) ! So, after our "mini-photo session" on Halloween morning, we headed back to Johnson City and stopped by the mall for some lunch. 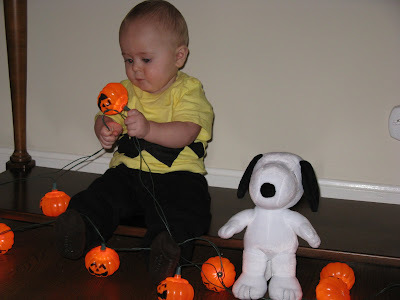 Ben was also on the hunt for a Snoopy doll. A friend of mine from work, Connie, collects Snoopys and actually let us borrow one. But, apparently that wasn't good enough for Ben...he wanted Aidyn to have his own. :) So we went by Hallmark Cards and sure enough they had one. 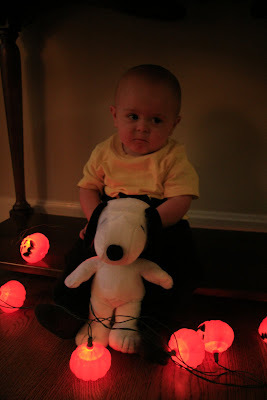 *Aidyn checking out Snoopy for the first time when we got home from the mall. Then we returned home for a nice looong nap before beginning our Halloween "rounds". Originally, the plan was to start about 4pm. However, Aidyn had a plan of his own...and I'd have to say I didn't much mind. :) Ben fell asleep on the couch watching football not long after we got home. Aidyn laid down for his nap around 2-2:30pm, and I decided to lay down myself. I didn't wake up until Ben woke me up at 4:45pm! (aaaa, sleep!) We got ourselves ready and then Aidyn woke up around 5pm. He must've been exhasuted! *All of these pictures posted are from my parents' house. This one is dark, but if you can see Aidyn's pouty face...it'll crack you up! The little lip turned out and all. Ha! We only went to 3-4 houses, but by the time we got home around 9:00pm...we were all pooped! I decided that Halloween is DEFINATELY much harder than Thanksgiving and/or Christmas. Atleast for those holidays, Ben and I only have 2-3 stops and that's usually over the course of 2 days. Needless to say, we ALL slept good that night. The extra hour of sleep was much needed and appreciated! Sunday afternoon I sat down to look at my pictures and I realized what a TOTALLY TERRIBLE mother I am! 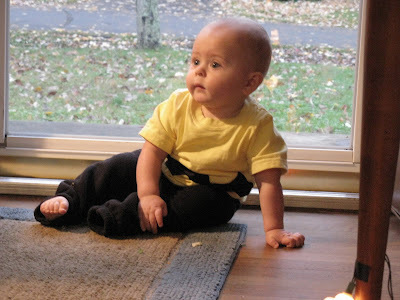 I didn't take ONE SINGLE picture of Aidyn on his first Halloween in his first costume! Granted, both my mom and Ben's mom took enough for all of us...but still! I felt awful! So, to "kinda" make up for that...I was sure to get Aidyn's picture with his first Jack-o-lantern in his fall sweater that we bought for our family portraits. 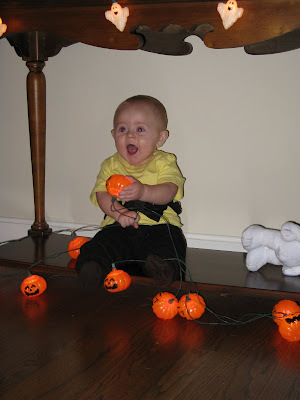 Can you tell that his pumpkin only has two bottom teeth....just like Aidyn??? He is absolutely adorable! And I love his costume!